It has been a little over one year since I picked up my Turbo X. A pretty decent set of timing that Saab have all but announced the purchase of their company by Swedish super-car designer and producer Koenigsegg (say that one 5 times fast! I’m going with K-Saab). As a Saab fan this is pretty much the best case for what could happen to Saab. Getting picked up by a design focused Sewdish firm – wow. Imagine the cars that could be made. 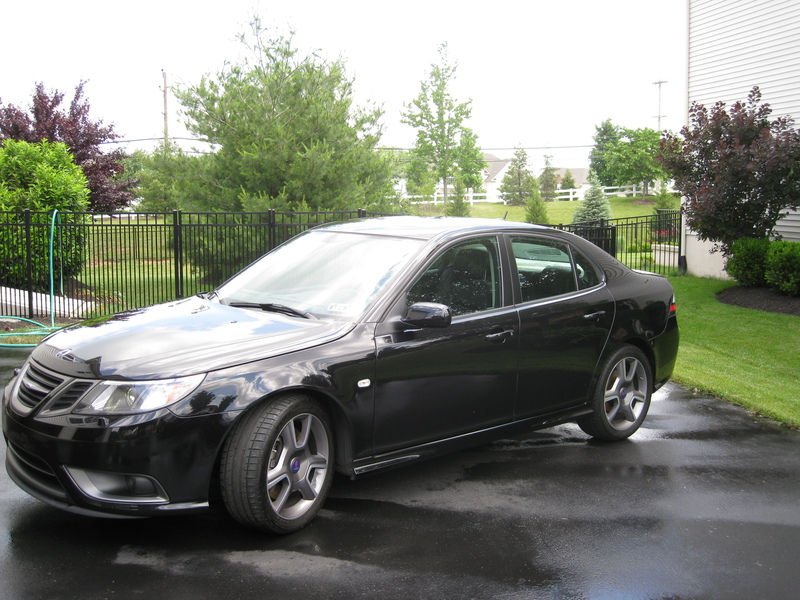 All the Saab fans out there must really be happy. I know I am. As I said this is 1 full year with my car. With 20,000 miles on her I’m a very happy owner. No mechanical issues, smooth riding, and decent mileage for a car of this type. Now if only PENN-DOT and the birds could be a bit nicer 🙂 To celebrate the occasion I decided to give my car the “Meguiar’s Treatment”, that is a full clay bar treatment. Washing with NXT (I’ve used NXT wash and wax throughout the first year), Meguiar’s clay bar kit with their quick detail as a lubricant, and then a full tap and max job with Meguiar’s Cleaner Wax. I’ll re-wax in a couple of weeks with NXT. Judge for yourself, here’s a few pics of the car. If you zoom in on the hood you can see this is a working car – no toy. The DOT in PA is really brutal – they do not use sand in the winter. They use crushed blue stone and this really is a much more aggressive abrasive than the normal sand. The wide plastic faring on the front of the car is particularly beat up. I plan to use a paint kit from Saab to re-paint the nicks in the hood, we’ll see how that goes. I’m pretty impressed with the Meguiar’s clay kit. The car is glass smooth…maybe even smoother than that. It is hard to describe how smooth. More like a polished gem or piece of crystal. End to end the job was about 5 hours. Taping took the longest. There must be a better way, but the results are pretty good I think. Congrats on a fine choice of automobile! Very pretty Turbo X…… and it’s so hard to keep a black car looking good !!!! 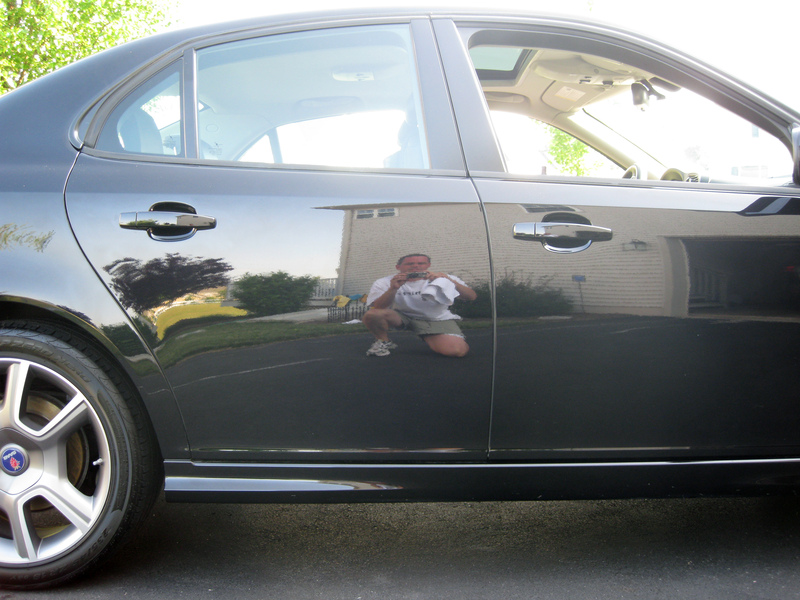 On my own KoenigSaab I’ve recently been using basic Meguires Quik Detailer (without the clay bar) for prepatation, and just Quik Wax spray, but was looking to step it up a level…… either to the NXT range or the Ultimate range. Did you find that the Cleaner Wax made much of an improvement for you? Or are you looking forward to applying the NXT wax again? Are you very happy with the NXT? I want to go for the Clay Bar/Quik Detailer/Spray Wax combination in either the NXT range or the Ultimate range. Still trying to decide….. your input is welcome. PS: Do you use the microfiber cloths? They are great. Thanks very much. I certainly will need to get a paint job in a couple of more years. The clay bar was really quite amazing. The cleaner wax was simply part of that treatment, but yes I think it did a better job of removing dirt where NXT yields a deeper shine. Yes I use microfiber cloths exclusively. I use Cobra cloths from autogeek.net. Thanks for the tips, I’ll definitely put the cleaner wax in the mix when the next big detail comes along for the Viggen. I’ll let you know how it goes. To me most of the interior products are very similar. I prefer products from Pinnacle. Previous story Creating A Thick Java Application – in 2009?